On October 15, 1957, veteran-leaders convened and took the first step that would lead to the unification of all veterans organizations in the country. Less than two months later, on December 9, 1957, twenty two veterans-leaders representing all known veterans organizations signed an "INSTRUMENT OF UNIFICATION" which became the VFP's "DECLARATION OF PRICIPLES." On March 15, 1958, the Federation held its first General Assembly with the late President Carlos P. Garcia as Guest of Honor. Impressed with the veterans' efforts, President Garcia encouraged the drafting of an administrative bill granting a charter to the Federation. With the President's urging, then-Congressman Ramon D. Bagatsing authored H.B. 1489, which was passed in Congress on May 19, 1960 and was eventually signed into law by President Garcia as Republic Act 2640. 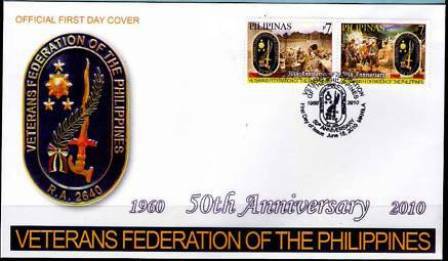 The Act officially established what has come to be known as the "Veterans Federation of the Philippines (VFP)".